With the inflowing energy, from all sides, electric forces draw solar winds from the Sun and accelerate them into all direction to the tremendous speed of 850 km/sec., and heat them up to several millions of degrees, from the surface temperature of 5,800 degrees Celsius, and this likewise in all direction. Only in the equatorial region are the solar winds less powerful, where the heliospheric current sheet connects up with the Sun. The Sun's magnetic field appears to be related to the inflowing electric current from the heliospheric current sheet. The current sheet appears to split within the Sun into a current flowing both northward and southward from the center, as is indicated in the Alfven Model below that applies to both the galaxy and the Sun. The two opposing North/South oriented currents described above, that according to the Birkeland current principle are spiraling in opposite directions would create two opposing magnetic fields with a differential between them that determines the overall field direction, and also the cyclical flipping of the overall magnetic direction by changes in the imbalance, which a resonant magnetic shifting of the heliospheric current sheet that is feeding it can easily accomplish. While this is mere speculation, it is the general perception. Contrary to what one might expect, the solar magnetic field flips in direction during the high point of the solar activity cycle when numerous electromagnetic factors interact and the flow pattern become chaotic. The specifics involved are currently beyond our knowledge and may forever remain in the land of theories. There are theories floating about of a solar dynamo operating. 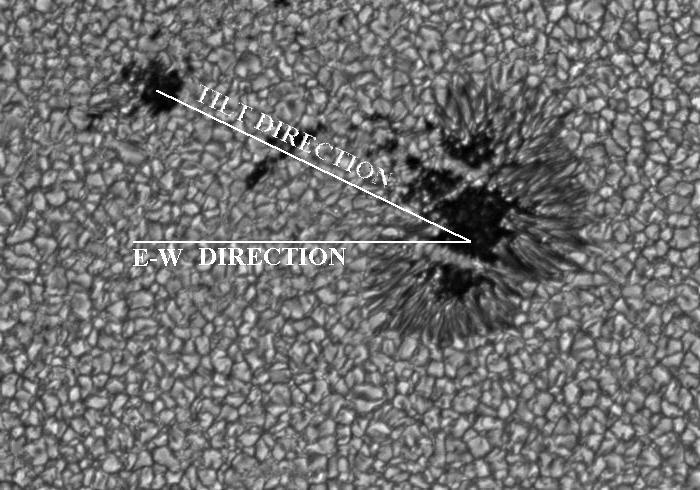 A successful model for the solar dynamo must explain several observations: 1) the 11-year period of the sunspot cycle, 2) the equator-ward drift of the active latitude as seen in the butterfly diagram, 3) Hale's polarity law and the 22-year magnetic cycle, 4) Joy's law for the observed tilt of sunspot groups and, 5) the reversal of the polar magnetic fields near the time of cycle maximum as seen in the magnetic butterfly diagram below. The principle described above would satisfy the 5 requirements. It is interesting to note that while the Sun's energy output in the visible light spectrum and below remains constant within a fraction of a percent, in the high-energy band the difference between the solar maximum and minimum is in the order of a 2,000% (20-fold) for the high energy band from UV up to the x-ray band. Above are X-ray images of the Sun captured 4 months apart between 1991 and 1995 by the Yohkoh spacecraft. When the Sun is at its brightest in the high-energy spectrum, corresponding with the highest electric flux density, the magnetic reversal takes place. However, the observed flipping of of the Sun's magnetic field appears to be only skin deep. We observe the flipping by surface effects in the electromagnetic tangle in the upper atmosphere of the Sun. This does not mean that the underlying magnetic field of the Sun as a whole is flipping. The sunspot phenomena are a part of the surface effects. It may be these effects alone that go through cyclical changes, and since they are surface effects, they are more likely affected by external conditions of the 'space weather' cycles within the solar heliosphere. What cyclical forces are moving within the heliosphere remains yet to be discovered. However, the size of the heliosphere is such that resonant 11-year solar cycles would correspond to electric loop cycles with a propagation speed of roughly 300 km/sec, which has been observed in the heliospheric current sheet. 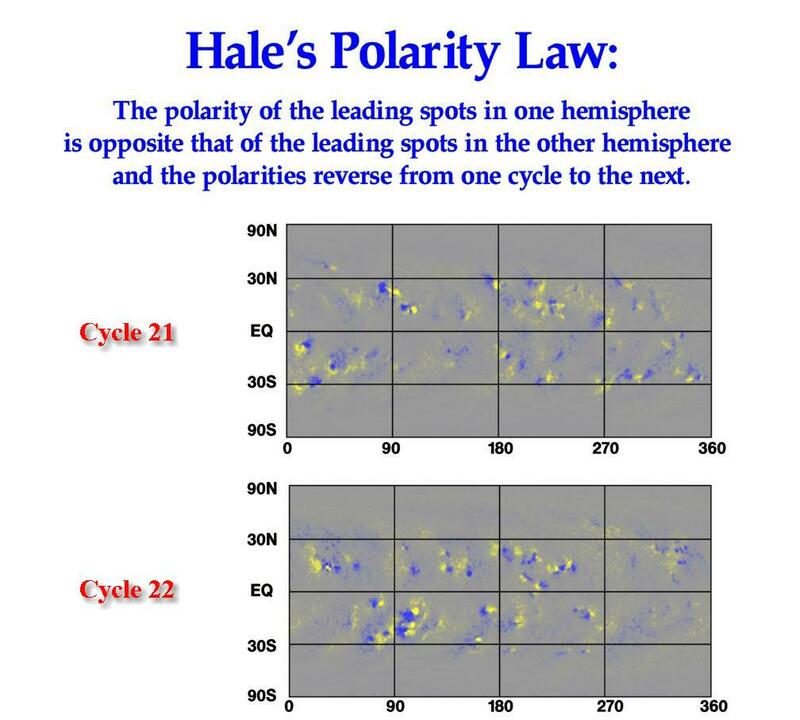 The solar cycles may merely reflect electric intensity changes in the loop circuits, which when they are high enough create a tangled mess in the magnetic fields of the surface features until a new stable state becomes established. The above Coronagraphs by NASA - LASCO. Top image during the low of the solar cycle (1996/0504). Center image of the high in the solar activity cycle (200/1112). The bottom image shows the measured solar wind speed by NASA's Ulysses mission that flew a spacecraft over the Sun's poles perpendicular to the plane of the ecliptic. We need to recognize that the surface of the Sun is not a solid, but is a gaseous plasma that is extremely affected by electric and magnetic forces. This fact is evident by the differential speed of rotation at the various latitudes. The fact the surface of the Sun spins faster at the equator than at the pole, indicates the rotation of the Sun is actively powered by an external forces which acts more powerfully at the equator. While the entire surface of the sun is electric powered, the greatest power input relative to the spin axis is at the equator. The rotational difference naturally causes a fast tangle of eddy currents, with magnetic differentials between them with effects that penetrate the surface in the form prominences of magnetically motivated electric plasma currents. It is a basic fact of physics that magnetism is created by the flow of electric currents, and that the generated magnetic fields become a force that act on the flow of electric currents. When we see the giant prominences erupting at the surface of the sun, we see electric plasma currents, shaped be magnetic field lines that are themselves created by the movements of electric currents perpendicular to the magnetic fields. Since the prominences are localized events, the motivating electric currents are evidently eddies caused the differential rotation of the Sun's surface plasma. When the field lines become broken by too much stress, the moving electric energy that then no longer flows in magnetically aliened channels, explodes into space, leaving gaping holes behind in the photosphere. Nevertheless, in spite of their magnitude (some loops are so big that the planet Jupiter could fit inside them) the prominences, sunspots, and coronal mass ejections as solar flairs are now called, are but minuscule surface phenomena of an immensely high powered system. The energy that flows in and out of the Sun has been 'estimated' to be app. 380 quadrillion terrawatts, or 60 megawatts per square meter of its surface. This adds up to a power flux of 1,200 watts per square meter at the distance of the Earth from the Sun. This is the electric energy the Sun draws from space, and there is more than enough of a resource existing to satisfy this requirement. Ralph Jurgens calculated that a flow rate of three electrons per second per square centimeter at the distance of the Earth would satisfy the energy needs of the sun at the several billion volts of charge separation that the double layer effect has created around the Sun. The needed flow of 3 per second is minuscule, from a reservoir of 90 (measured by NASA as the electron density per cubic centimeter in near-earth space). In other words, no fusion is needed to light up the Sun, and the great fireworks that we see is the logical expression of an intensely electrically powered cosmic body according to its size and gravity. Also, what we see for the Sun applies to all of the planets as well. With the Sun rotating counterclockwise, powered by external electric forces, we see the entire solar system rotating counterclockwise as well, with the planet's orbits being electro-magnetically aligned along the ecliptic and moving according the principle of the homopolar motor. It is a rarely acknowledged fact that the orbital speed of the planets diminish with their distance from the Sun (47.9 km/sec for the innermost planet, Mercury, and diminishing to 4.74 km/sec for the outermost planet, Pluto). This means that when we look at the Sun and its cyclical surface phenomena, we need to consider the dynamics of the entire heliospheric system that the Sun is the central part of. Its gravitational field governs the shape of planets, just as its magnetic field in conjunction with electric forces govern the average speed of the planet's orbits. With this in mind we've begun to look at the Sun in its larger dimension, the heliospheric dimension. For this purpose the Ulysses spacecraft was created that enabled us to see the Sun from a perpendicular orbit to the ecliptic, over the polar regions. Some people were surprised by the measurements. The measurements taken by Ulysses indicate that the solar wind speed remains at a fairly constant 850 km/s throughout the upper and lower hemisphere, except for the equatorial region where the heliospheric current sheet connects. This measured near constant acceleration of the solar winds to 850 km/sec reflects the near uniform density of the electric plasma (energy) flowing into Sun, which also accelerates the solar winds away from it. This measured average wind speed doesn't change for the high or low solar activity cycles. The constant inflow of electric energy into the Sun, and the constant outflow in solar winds and secondary electric currents, create a fairly constant dynamic environment around the solar system, called the heliosphere, And the heliosphere is large. It is roughly 10,000 times larger than the Sun itself (measured to the heliopause). Sun is comparable to a point made by sharp pencil on a peace of paper, so that on this scale the heliosphere can be seen in comparison a surrounding sphere that is 3 feet across. The heliosphere is so big in real terms that even the biggest Coronal Mass Ejection (CME) from the biggest sunspot amounts to nothing more than just a fleeting local event with no noticeable impact on the whole. While these massive local events often affect the Earth, they have no measurable effect on the overall dynamics that shape the heliosphere that ultimately determines the 'space weather' for the solar system. The heliosphere is a dynamic electric system of electric plasma streams and interacting magnetic forces that form a dynamic sphere around the Sun and solar system, which also creates a protective barrier around the solar system that attenuates the density of the comic-ray flux that pervades the galaxy and possibly all cosmic space. CMEs may have an additional shielding affect for the Earth. During periods of low sunspots or none at all, the cosmic-ray density appears to be slightly greater, giving the Earth colder climates as the result of increased cloud formation by increased cosmic-ray ionization of the atmosphere. The Little Ice Age may have resulted from such (missing) local causes for shielding against cosmic rays. The bigger climate cycles are evidently caused by the larger electro-dynamics that shape the heliosphere itself that is the primary attenuating shield of the world against cosmic ray flux. The heliosphere may be seen as a faint balloon inflated by the pressure of the solar winds out flowing from the Sun, which is also shaped by the electric currents flowing within it, corresponding to the Alfven Model that applies to both the galaxy, the Sun, and also the Earth in the small. Within the heliosphere the inward flowing current forms a sheet-type structure termed the heliospheric current sheet. The current sheet is a part of the radial circuit that closes the outward electric currents that are aligned with the Sun's magnetic field flowing from the Sun's polar regions. These currents are not the powering agent that light up the sun, but are minor secondary affects of the electric power streams that power the Sun that bind plasma into atoms and create heat and light, and other energetic radiation in the process. The minor radial electric current that also results in this dynamic process creates a heliospheric circuit on the order of 3 billion amperes. As a comparison with other astrophysical electric currents, the Birkeland currents that supply the Earth's aurora are about a thousand times weaker at a million amperes. The thickness of the current sheet is about 10,000 km. The heliospheric current sheet is also sometimes called the interplanetary current sheet. Since electric currents are affected by magnet fields, and Sun's rather strong magnetic field is rotating with the rotation of Sun, the heliospheric current sheet is rarely flat as is indicated in the model above. It becomes near flat when Sun is at the minimum of its solar cycle, its most settled state between its polarity changes, but at the high activity stage when the magnetic polarity is changing to its inverse stage the heliospheric current sheet is forced in a spiraling wave pattern akin to the swilling skirt of a spinning ballerina. A similar swirling pattern applies to the out flowing electric currents for the Sun's polar regions. In considering the size of the heliosphere, of roughly 15 billion kilometers across, the swirling electric pathways, and the average speed of the current flow in the range of less than 300 Km/sec, an electric cycle time of slightly more than ten years would result. It might well be that the 11 year solar cycle is am electric phenomenon determined by both the the size of the heliosphere and the dynamics of the current movements within it. In a briefing on Sept. 23, 2008 at NASA headquarters, solar physicists announced that the solar wind is losing power. Green curves trace the solar wind in 1992-1998. While-blue curves denote lower pressure winds in 2004-2008. Curiously, the speed of the million mph solar wind hasn’t decreased much—only 3%. The change in pressure comes mainly from reductions in temperature and density. The solar wind is 13% cooler and 20% less dense. The heliosphere is a bubble of magnetism springing from the sun and inflated to colossal proportions by the solar wind. Every planet from Mercury to Pluto and beyond is inside it. The heliosphere is our solar system’s first line of defense against galactic cosmic rays. High-energy particles from black holes and supernovas try to enter the solar system, but most are deflected by the heliosphere’s magnetic fields. Unpublished Ulysses cosmic ray data show that, indeed, high energy (GeV) electrons, a minor but tell-tale component of cosmic rays around Earth, have jumped in number by about 20%. Before the Ulysses project was launched our satellites have observed the Sun exclusively from the plane of the ecliptic, which means that we have only observed its equatorial regions in detail. The Ulysses probe was launched in 1990 to study the Sun's polar regions. It first traveled to Jupiter, to "slingshot" past the planet into an orbit which would take it far above the plane of the ecliptic. Once it was in its scheduled orbit, it began observing the solar wind and magnetic field strength at the high solar latitudes. It found that the solar wind from high latitudes were fairly steady at 850 km/s, and that there were large magnetic waves emerging from high latitudes which scattered galactic cosmic rays. Since the magnetic field is getting weaker and the solar wind colder and less dense, as it also discovered, the observed results tell us that the Earth is gradually getting colder, which on-the-ground measurements at the Solar Terrestrial Institute in Irkutsk (Siberia) have have confirmed. It also tells us that we live in an electric universe. The same dynamics of current flow that have been recognized to govern the galaxy (discovered by Hannes Alfven long before they were actually visually recognized by NASA) is now recognized to be reflected in the dynamics of the Sun, and also of the Earth, reflected in aurora. If the Sun was a nuclear fusion furnace, totally different principles would apply, with different phenomena. While the recognition of the electric nature of the Sun is still being blocked from public perception where the cosmos is deemed to be ruled exclusively by gravity and came into being by a gravity induced big bang, advanced instrumentation is enabling us increasingly to see the Universe as it really is by which the gravity-only myths are fading from view. And as the mythologies are fading the infinitely available electric energy resources that power cosmos come increasingly into view as a readily accessible energy resource for use by mankind to meet its energy needs. We live in a Universe of high-power, electric, and anti-entropic energy, with greater resources surrounding us that far supercede our needs. And so it has be, because nuclear-fusion is not an energy source. There is no such thing as a fusion powered Sun, because nuclear fusion is a power consuming process. The phenomenon of a fusion-powered sun is not possible in the real Universe, because nuclear fusion is inherently an energy consuming process. The energy that is derived from nuclear-fusion experiments on Earth, or is unleashed as the fury of the hydrogen bomb, actually results from a process of nuclear fission, a deconstruction of what had been preciously built. In our fusion labs two heavy isotopes of hydrogen (the so-called nuclear-fusion fuel) are fused together in a high-powered process, where in the fusion process one breaks apart and releases the energy that had been previously invested into it by the atom building process, the kind of process that is electrically powered at the surface of the Sun. The heavy isotopes of our so-called fusion-fuel are overbuilt atoms, born in the intensely energetic electric interaction at the surface of the Sun. We use the 'charged batteries' that the solar process has created for us, and even this we cannot get to work efficiently. It is not possible for such a process (that requires 'charged batteries' that must first be created), or any fusion process, to power a sun. The most significant finding that the Ulysses probe brought home is that the overall power-level in the heliosphere has been declining over the last 50 years. While the decline is centered on the Sun, such as the reduced density of the solar wind, the reduced underlying magnetic field of the Sun, the shrinking of the size of the heliosphere, and so on, the overall cause for these secondary effects is evidently found in the electric-energy-density that powers the Sun. In the entire solar system, nothing exists in isolation. But this does not mean that earthquakes are caused by solar effects. The weak solar effects, even from great coronal mass ejections, do not alter the underlying tectonic plate movements of the Earth, as such have been blamed for the 2011 earthquake in Japan. Ulysses tells us that dynamics of the solar system is getting weaker, not stronger, and been on this trend for 50 years. Nevertheless that is a strong increase in earthquake activity apparent in some regions of the world since the year 2000 timeframe. This increase corresponds with the start of a new military-science adventure that modulates the power of the Northern Polar Electrojet, which originates with galactic forces, to produce extremely powerful Very Low Frequency Alfven Waves that penetrate deep into the ground and excite molecular resonances. In this sense, the vast electric forces of the galaxy, and to some degree our Sun, can be held responsible for the giant 2011 Japan earthquake since we have learned to manipulate them for military applications.